Looking for Sewer Ejector Pump or Grinder Pump services in Hampton, VA? Rooter-Man can install, inspect, or repair many types and brands of sewer pumps including but not limited to: Bur-Cam, Everbilt, Liberty Pumps, Little Giant, Ridgid, Wayne, Zoeller, and many more. Sewage ejector or grinder pumps are commonly used in residential homes basements or commercial buildings basements in Hampton, VA because the main sewage line is higher than the basement plumbing pipes. 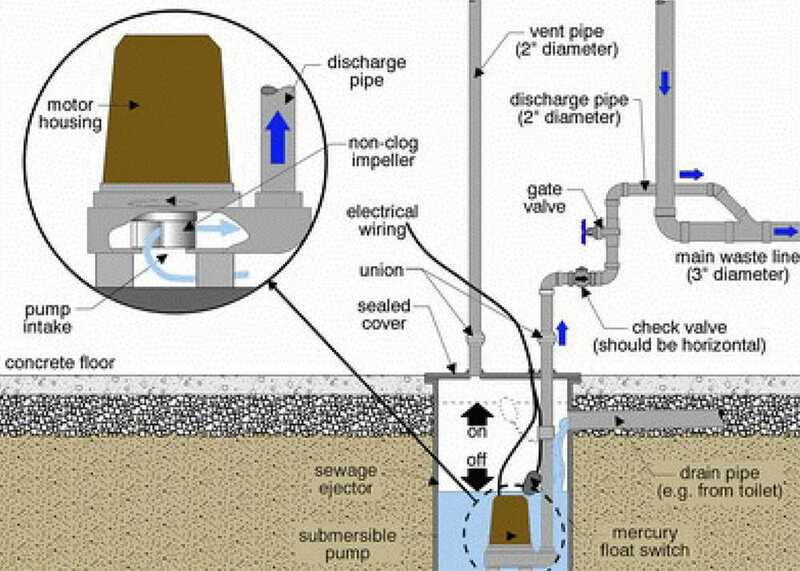 For instance, when a toilet is located below the main sewer line the flushed waste has to be elevated up so that it can be discharged along with all of the other waste water. Contrary to popular belief, not all sewage pumps grind up the waste, instead they pump the solids by velocity with an impeller. Some impellers can break up the waste but it will not be finely ground up. True grinder pumps will actually shred the sewage and then pump it through the pipe. The main benefit of using a sewage ejector grinder pump is that paper and other debris that get flushed down the toilet are grinded down to help flow through the sewage system more efficiently and not cause clogs in the pipes. These are powerful pumps, and until recently most sewage grinder pumps have only been available for commercial use in Hampton, VA but are now available for residential usage. Grinder pumps are usually installed where the sewer is a long distance from the home, or there is a high vertical lift of more than 20 feet or so.